Hornetudes.com is an excellent new resource created by Ricardo Matosinhos, a professional horn player and teacher in Portugal. You can read his full bio for more details, but in short Dr. Matosinhos is an experienced player and teacher with a diverse musical background. Among his other horn-related projects are the Horn’s Pocket Guide, a handy reference for horn players of all levels, 12 Jazzy Etudes for Horn, and two more etude collections pending publication. I’ve spent some time over the last few days perusing hornetudes.com, and I can already tell that it will be an invaluable resource for students, teachers, and professional players. According to the description on the home page, hornetudes.com is meant to accompany Ricardo’s dissertation, titled Selected and Annotated Bibliography of Horn Etudes Published Between 1950 and 2011. This site takes the form of an interactive database with numerous search options encompassing a substantial catalog of etudes for horn. I should also add that the site is being regularly updated with new additions, which Ricardo posts on the hornetudes.com Facebook page. Users can browse through the bibliography alphabetically, or display entries according to publisher, difficulty level, size, and/or country and date of publication. Here’s a screen shot showing one of the entries. 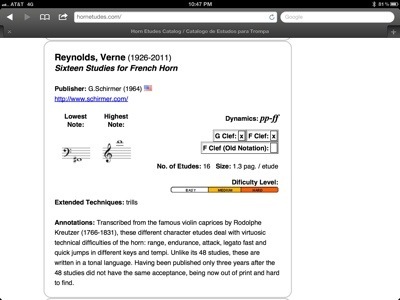 Title and author are listed at the top of the entry, in this case Sixteen Studies for French Horn by Verne Reynolds. This entry caught my eye because I was not aware of another set of etudes by Reynolds in addition to his “great 48,” or 48 Etudes for French Horn. Each entry contains a wealth of information, such as publication date – these studies were actually published after the 48 Etudes – publisher’s website, range, difficulty level, number of etudes, dynamic ranges, extended techniques required, and the average length of each etude. Helpful annotations can also be found at the end of the entry. For these studies, the following explanation for their being little known is provided. Unlike its [sic] 48 studies, these are written in a tonal language. Having been published only three years after the 48 studies did not have the same acceptance, being now out of print and hard to find. Though they are out of print, I plan to keep my eyes open for a set of these rare etudes, and I wouldn’t have known about them without the information contained on hornetudes.com. It’s a great website, and potentially a very powerful tool for research. Congratulations Ricardo, and thank you for providing this resource! Thanks Mr. Boldin for making this hornetudes.com review. I’m trying to improve the search options for the website and the way the etudes are listed, this will require some programming skills, so will take a while. I’m also making agreements with websites (other than sheetmusicplus and imslp) for making links directly to the products allowing people to see some sample pages. You’re very welcome Ricardo, and thank you again for providing this resource. Now is possible to sort by extended techniques (no extended techniques, stopped notes, echo sound, glissandi, flatterzunge, trills, horn chords, percussion effects, mute, micro-tonal writing, half-valve, air effects).